And this sure as heck ain't the season for wargaming in my non-AC semi-attic room, not until the humid 30C temperatures subside. Still, one can often manage something in the early morning or evening, in between chores. The Minnow does her Cat Goddess Statue thing while waiting for me to regain my senses. Almost a decade ago, in the days when I was convinced multifigure stands were the answer to almost everything, I decided that movement trays were the next best thing for Charge! and bought some sticky backed magnetic sheets and plastic metal bases. Since I only played Charge! something like one weekend every other year, I never quite got as far as making the trays though. Later, about 6 years ago, I decided to breakdown and conform to WHAB norms and use singles on movement trays for my new units. Didn't bother with magnets since they weren't planning to travel. That plan didn't last. I got pissed off when small but important rules changes weren't made legally available free or even cheap and appeared to invalidate existing unit structures. I decided changing rules made more sense. Today, I took five of those movement trays, some of that magnetic sheeting and some green paint then started putting PA figures on trays. The sheet needed some glue to reinforce the aging sticky back and the trays are too small to hold a whole Charge! 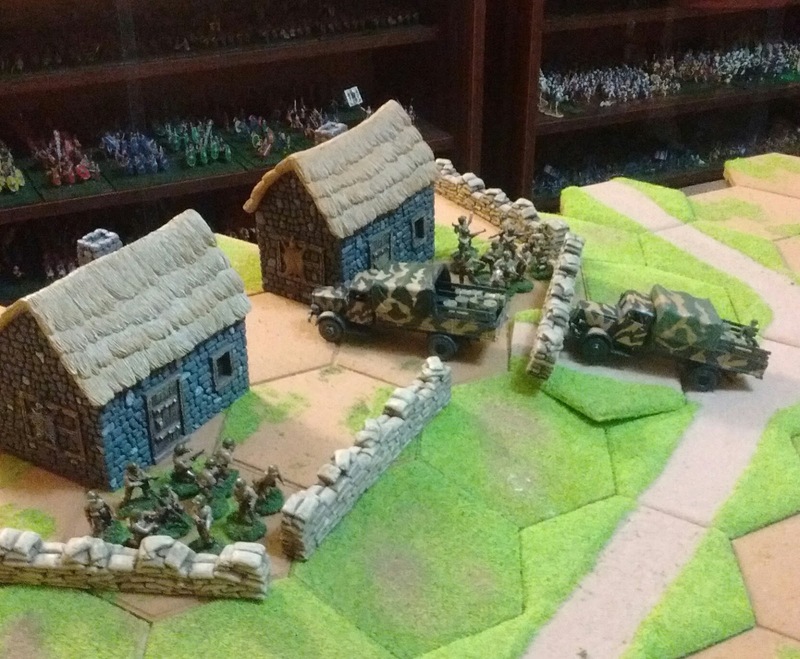 company but they will hold a MacDuff company and make it easier shuffling troops to and from the table with fewer dropped figures while retaining Charge! compatibility. I guess it was finally their season. Some old friends and some new. 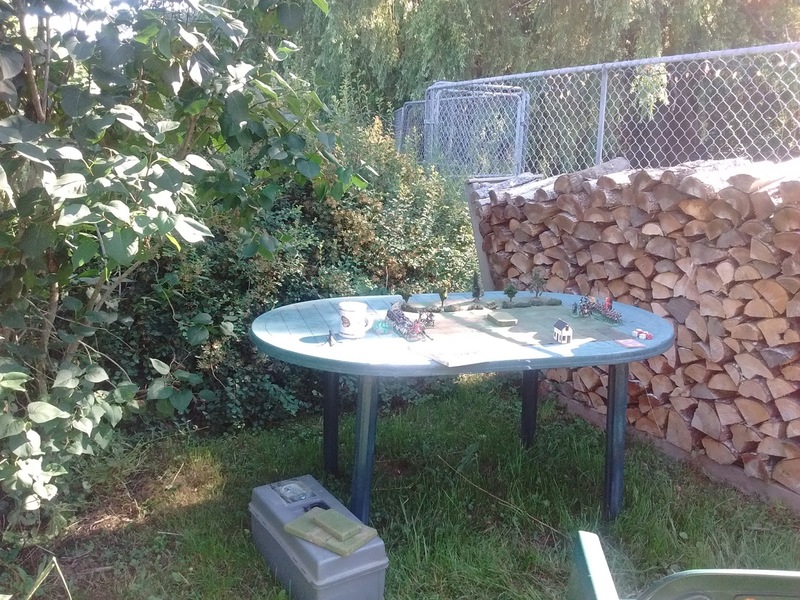 Yesterday I had the pleasure of accepting an invitation from Jeff to join in a multiplayer wargame about 150 km farther down the Annapolis Valley. I've known Jeff for around a decade now and had met one of the others before so it was a chance to meet two more very agreeable local gamers. Lutzen in 15mm using Commit the Garde. 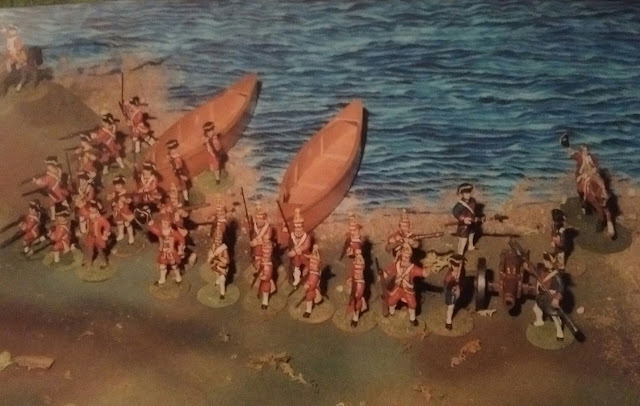 I painted my first 15mm figures in 1977 and through the 80's and 90's it was my primary scale with only ancients and later Colonials in 25mm and a few 1:300 WWII. When I upsized to 54mm instead I stored my 15's and then when I compromised largely on 40mm decided to sell off my 15's so that someone would get to use them. Jeff bought my Battle Honours & Old Glory French Revolution Russians (and possibly some of my Austrians too). 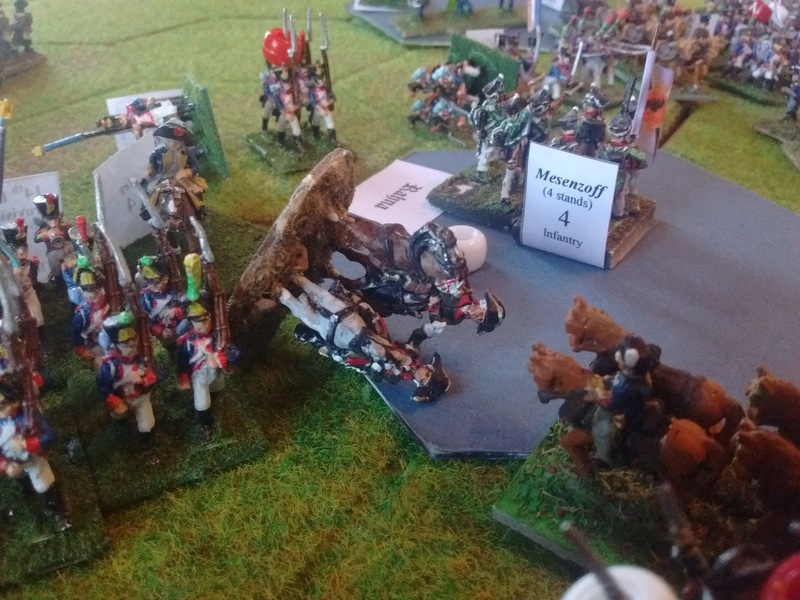 This game was set in 1813 but when Jeff started to run low on Russians some of my old lads came out to fill the OB so I had the pleasure of commanding a handful of them again. At one point the reinforcements included a more effective Command stand in the form of one of my old Generals (Not Suvarov alas). With great gallantry he stormed forward and led a battered regiment to seize the 3rd objective then commanded the gallant defense against a counter attack. Alas he caught a stray bullet so it was a sweet reunion but short. Meanwhile, as an old 54mm Colonial gamer I recommend a visit to der alte fritz and General Pettygree in the Sudan where some 700 54mm toy soldiers battled on Saturday. I would have loved to have been there but at least a token handful of my old Arabs volunteered for service and Jim was kind enough to include them in amongst the hordes on the embattled tables. Check the link and enjoy the post and pictures of the battle then go back and enjoy the preceding set up posts and pictures! The gentlemen involved have sunk a huge amount of time, effort and thought (not to mention money) into providing the spectacle so don't forget to let them know if you enjoy the report and want to see more. The Square Brigadier was originally designed assuming an average of 8 to 12 units per side so I wanted to try one of the One Hour scenarios with double forces on a larger table counting each square as 3" on the scenario map. My portable tabletop is close enough to this in size but the outside temperatures were pushing a humid 30C again and I opted to stay out of the sun. 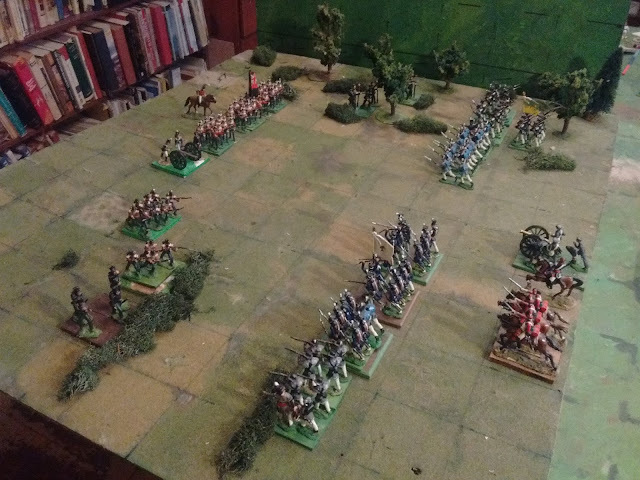 I wasn't sure I would like the look of 60mm wide horse and musket units on the 4" grid of my main table but there was only one way to find out. Turn 7. Blue's reserve is finally free to react to the flank attack. The scenario is certainly a plausible one for 1812. Since my table is rectangular I took advantage of the extra flanking squares to enhance the War of 1812 look by deploying a major river on one flank and woods as the baseline on the other. This look is not accidental by the way. The road networks were fairly primitive and the easiest way to move supplies was by boat so the settlers did and cleared the river bank forests for farmland first. In war armies moved by river as much as possible and fought over the adjacent cleared fields. Blue: 7 infantry (6 Regular, 1 Militia), 1 Light infantry (Riflemen), 2 guns, 2 cavalry. (1 Dragoon, 1 Mounted Rifles) 2 infantry and the 2 cavalry were held in reserve and the rest deployed along the river to guard the 2 crossing points. Red: 7 infantry, 3 light infantry, 2 guns. I detailed 5 infantry and 1 light infantry as the flanking force using 2 infantry, 2 light infantry, and 2 guns as the pinning force. The Rifles have been driven back by a bayonet charge and the American flank is in disarray. I actually played the game twice. The first game was played on Wednesday morning with the rules as played on Tuesday. 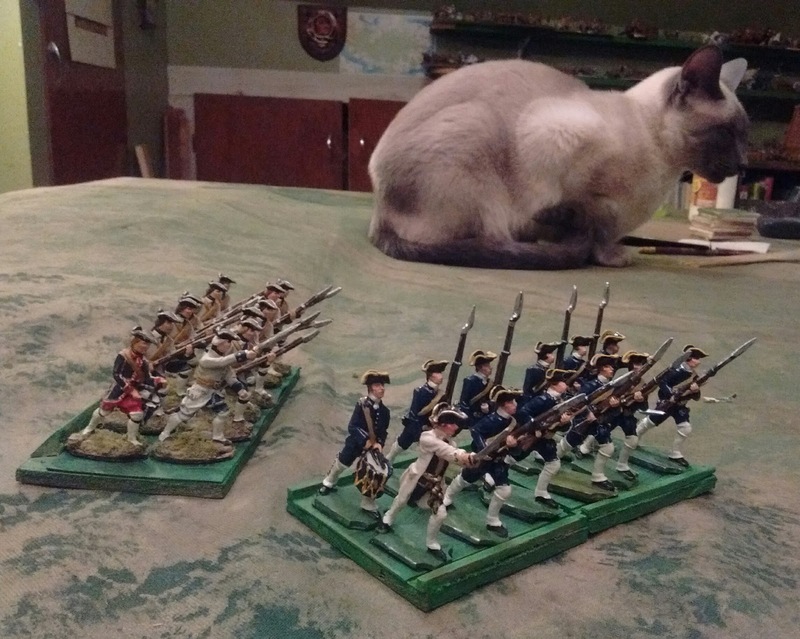 The British General (not me, nope) decided to put all of his light infantry in the flanking force. They handled the woods well but lacked the punch to beat back the American line infantry so an indecisive long range musketry battle developed while across the river the only contribution the line infantry could add to the 1 on 1 artillery duel was to launch suicidal unsupported charges across the bridge and ford into a stronger American line. 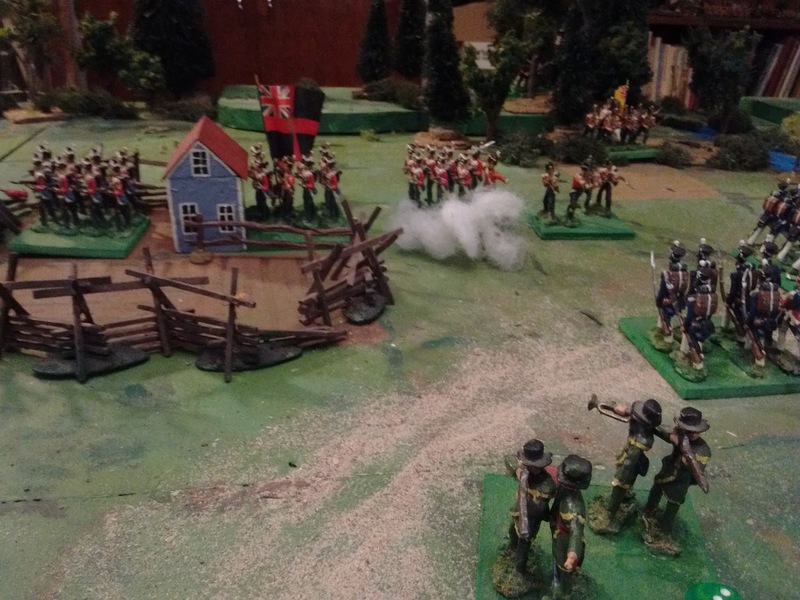 Despite a string of low command rolls and pitiful shooting, the Brits made some headway but it wasn't really close. One thing that had worried me in the small game was how quickly units became ineffective in melee once they had taken 1 or 2 hits. It was a double penalty sort of thing which I had tried in the early versions years ago and then dropped. I have no idea why I brought it back but I canned it again partway through this game when I remembered that I was supposed to be doing it that way. I also revisited shooting ranges and scales. Given how well the game flowed, the sorts of scenarios I am likely to want to play and the number of troops already available, I decided to drop the scale a bit to around 50-75 yards per square giving me around 150 to 200 men per line infantry base and allowing me to extend the ranges and have both long and medium ranges with fewer dice at long range. (Close range is included in melee) This improved the feel of the game substantially. The artillery and skirmisher duel across the bridge is heavy, prolonged and disappointing for Red who was overheard mid-game to mutter something very like "there seems to be something wrong with our bloody dice today"
This time around the British commander kept 2 light infantry units to support the artillery and sent 5 line infantry around the flank support by 1 light. That meant getting some line infantry through the wood. The rules allow a group of units to be moved on a order in the open but woods require an order per unit. As soon as the reinforcements arrived the General seemed to have a mental crisis and froze up rolling only 1 or 2 orders per turn. That meant instead of the intended flood of units hitting the flank of the American line supported by attacks from their front, there was a trickle of isolated units plus a formidable line of infantry advancing jerkily across the wide open spaces beyond the wood and far from the crucial river bank, all supported by a patter of ineffective long range fire. sigh........ The US commander was under no such handicap. 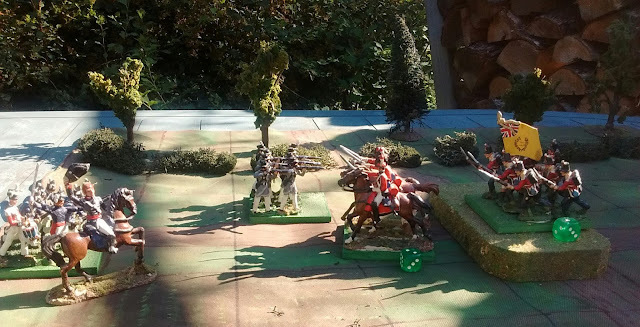 His reserves flew across the battle field his cavalry hitting the poor British Infantry in flank and rear while whenever the action got close, the American troops would roll out buckets of 5's and 6's. I began to despair! It couldn't last forever though and an American Achilles heel was found. They couldn't make a rally roll to save their lives, not even with their hotshot general attached. The only American unit that rallied well was the bloody Ohio militia in their tophats and grey smocks who came back for more, time and time again and held the bridge at the end of the day. The British regulars also kept coming back for more, not nigh as many as there were before, but coming back. Eventually the advantage in this sort of situation of having more infantry in place of light cavalry began to tell as did the British commander remembering that he could win either by routing his foe or by just driving him back at least 3 squares from each crossing. This led to a new focus and the Americans were forced back at the angle by the ford until at last, only 2 American units by the bridge remained within the critical zone and each of those could only take one more hit. If the British could get 1 more hit on the 2 units near the bridge or break any of 3 or 4 other battered units they would win a somewhat Pyrrhic victory. 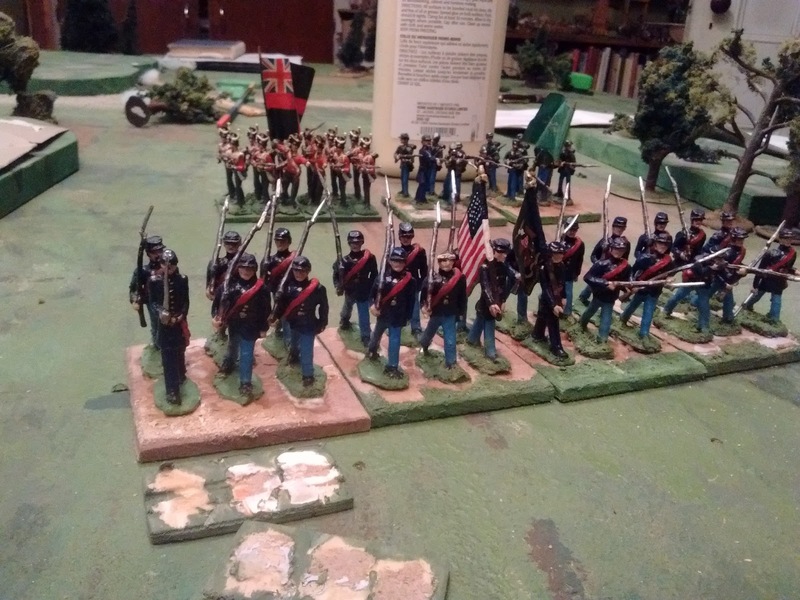 The Dice rolled....... the battery by the bridge was finally silenced and forced to retreat but the storm of grape and musket balls left the Ohio Militia standing firm and no units were left close enough to charge. 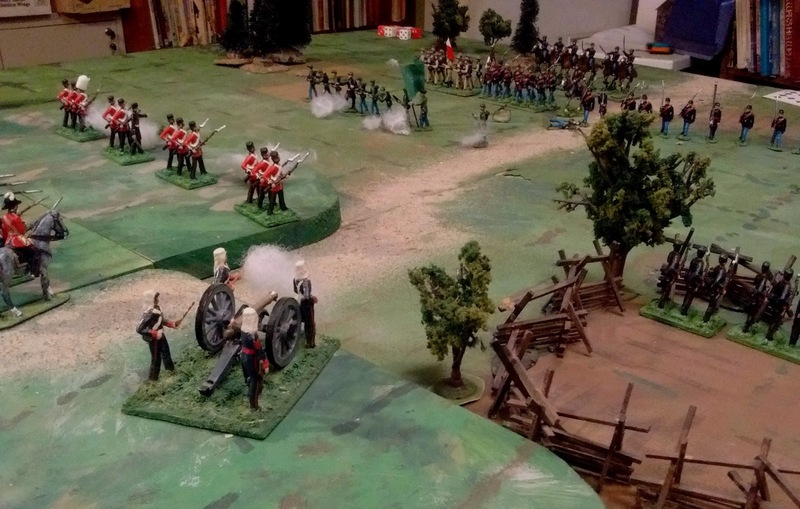 Across the river, the British infantry pressed forward everywhere and were thrown back or held everywhere. It was over. 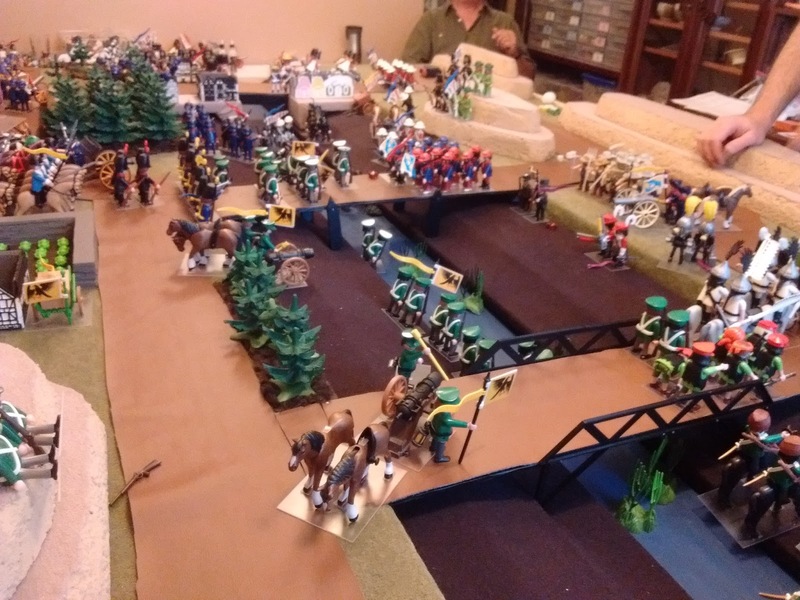 The Americans were only a hit away from their break point at the start of their turn but they weren't broken and the bridge had been held. (and presumably reinforcements were at hand) . Time well spent this week. There is absolutely nothing new in this edition of the Square Brigadier but the last 5 years have seen constant experimenting and testing of various combinations of ideas and this is the distilled essence. Not a perfect game but "My" game which is to say it runs the way I like it with the best elements of various of my past rules sets as well as many many borrowed and adapted ideas. I like the look and feel and the game play and find the results plausible historically. 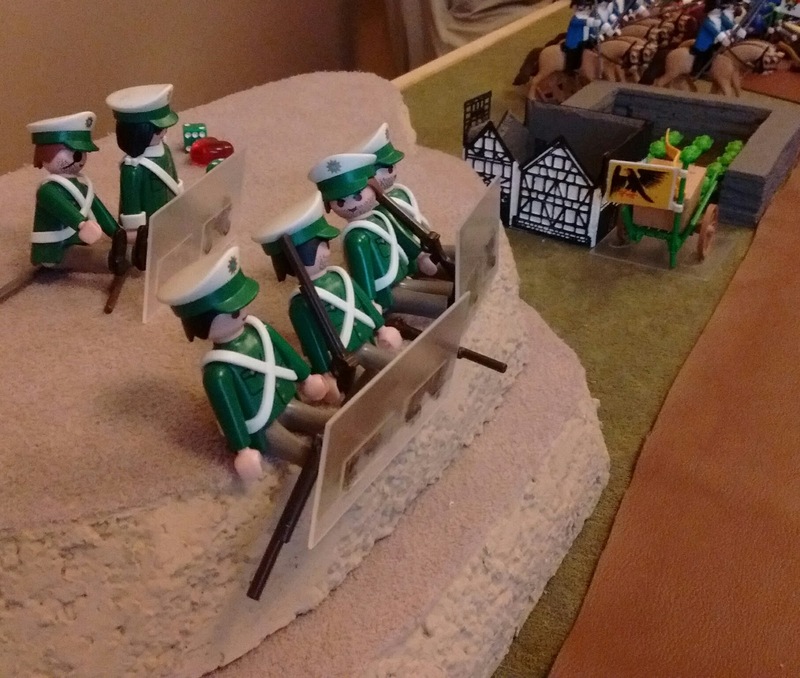 This combination of rules and figure numbers and basing is definitely the game for my Northern Atlantican campaign once I add a few more troop types, siege rules and so on for those campaigns. 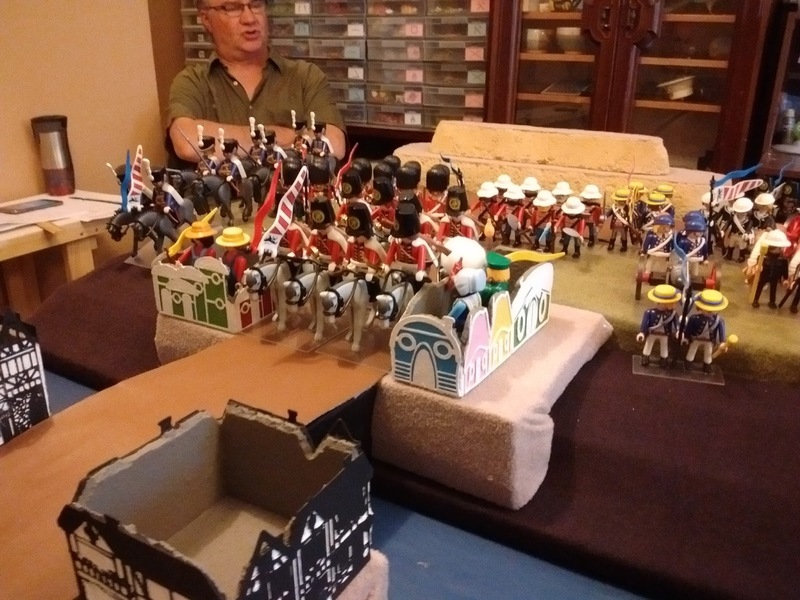 Imagining, planning and building the native armies can finally resume along with filling the last few gaps in my War of 1812 orders of battle. 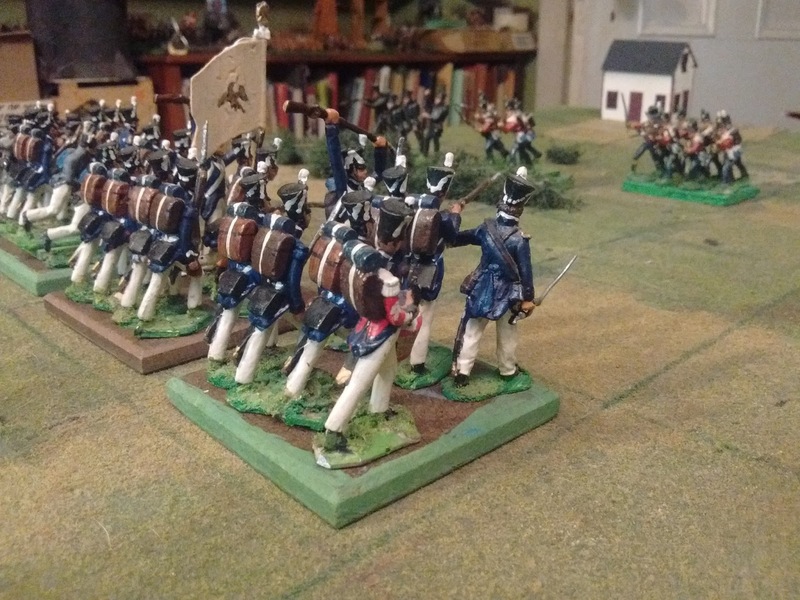 American artillery, British light dragoons and Quebec Militia are the highest priority for 1812, native infantry for Atlantica. 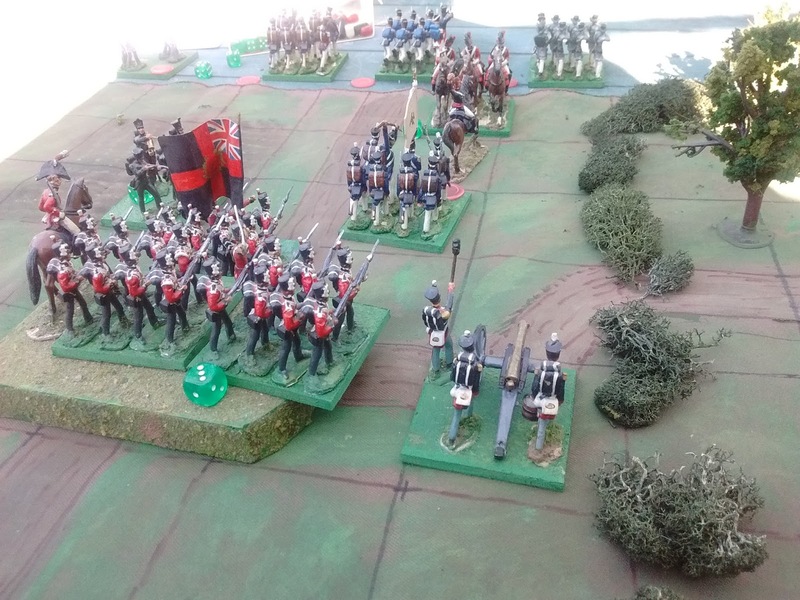 The plan for today did not actually including cutting two dozen bases, re-basing 150 or so figures and playing an outside One Hour Wargame scenario using The Square Brigadier. That's what happened though. 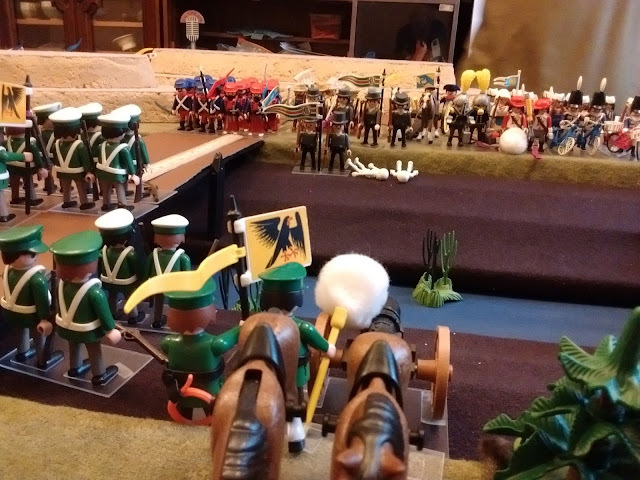 The New York Dragoons get cocky and are repulsed but the 104th Foot are doomed anyway. It was such a perfect summer's day that I decided to take the day off house and garden chores. Somehow that ended up with me, an offcut of 1/4" board from a previous reduction in my wargame table and my bandsaw. In no time at all I had a stack of bases already painted green. 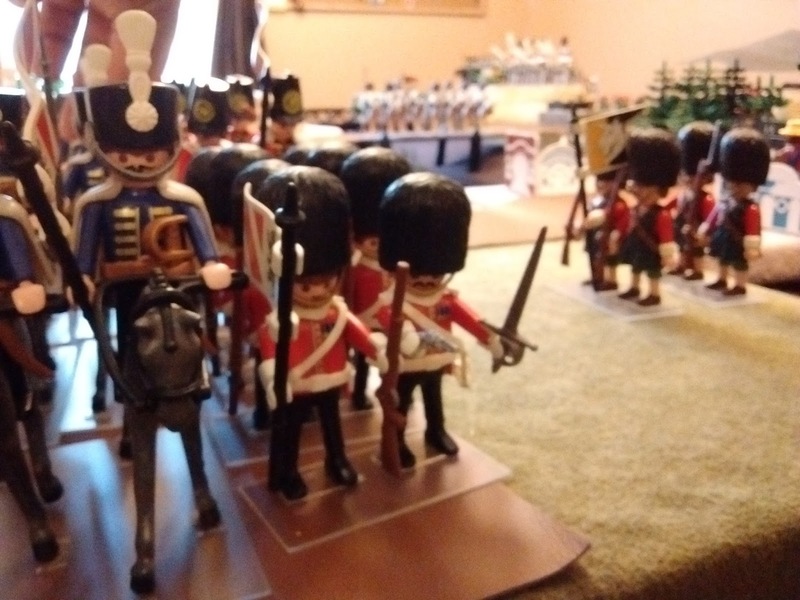 Since the 1812 figures had only been lightly tacked on temporary bases it took no time at all to pop them off and re glue them in their original 8 man companies. I touched up the edges and decided that flocking could wait. So there I was with the 20 odd stands needed for Crysler's farm and beautiful sunshine streaming in through the window. 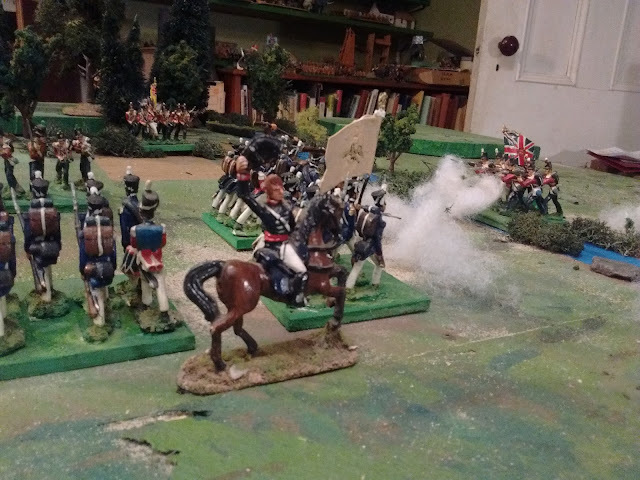 I didn't really feel like another refight of Crysler's so decided to grab One Hour Wargames and move the Square Brigadier outside. I intended to still use the 10x12 as close to Thomas's 3ftx3ft table if considering each square equivalent to 3" allowimng me to field 2 stands per scenario unit but saw my 9x9 travelling mat and decided to grab it and use 1 base per unit just to see if that would work. The setting: my shady corner between the woodpile and the Lilacs (and other assorted bushes). Not terribly good lighting for photos at 6 in the evening. Americans: 4 infantry, 1 riflemen, 1 cavalry. 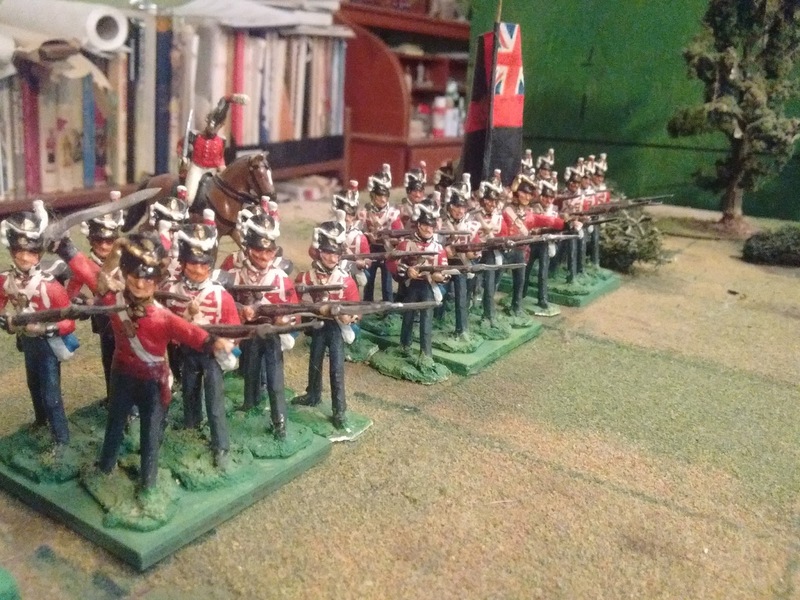 British: 4 infantry, 1 light infantry, 1 artillery. The game started off with the advantage swinging back and forth but slowly started to swing towards the British and then suddenly the American line collapsed. To my surprise the game went 12 out of 15 turns and lasted 1/2 hour excluding set up and take down. Using the larger board with 12 stands instead of 6 would probably have given a full hour of play but for a quickie it was just fine as it was. As dusk sets in (OK I'm shading the table with my body) the American forces rout leaving the British in possession of the hill. In summary: Bases: Check, Rules: Check, Grid: Check, Ability to handle scenarios: Check. 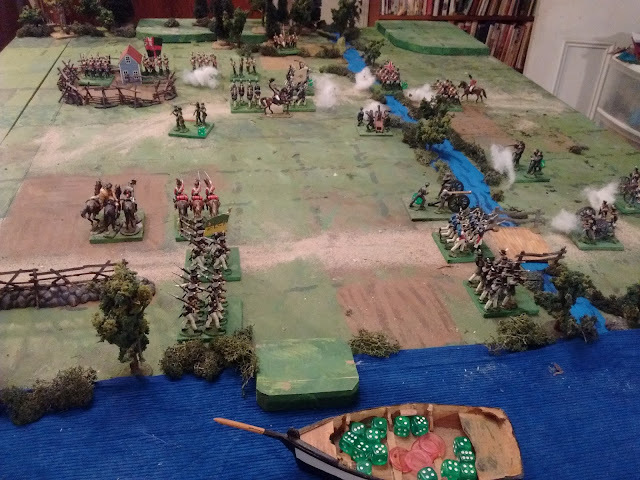 For those with an interest in history, this game is a direct descendent of this 2011 portable 1812 wargame (click) using my adaptation (click) of Bob Cordery's portable wagame. British infantry deployed as 3 game units representing 100 to 300 men each depending on the scenario rather than as 1 multisquare battalion or 3 x 400 men battalions. The important point was that I have finally gotten back to my plan to turn the War of 1812 back into a Square Brigadier campaign capable of being played on my main table or on my cardtable grid, including out on the patio table. A draft Square Brigadier in the War of 1812 has been written and as soon as I cut some more bases and get everything glued down flocked and painted, I'll give it a go. I need a bit more editing on the rules but they should be posted by tomorrow. No innovations but more focused. Today's adventure was a visit to Playmobile Land aka a friend's flat (think hot air balloon factory) for a 4 player VSF game using a marvelous (and HUGE) collection of 3" Playmobile figures (as in lots more figures and bits and pieces in storage) using a set of rules designed for 6mm Landships and armies. Seems appropriate, right? Anyway it was a fun afternoon and a hard fought game between the armies of opposing alliances of fictitious nations. I can't narrate the 4 hour battle, especially as I was too wrapped up to see much of what my ally was doing but the pictures and captions give some idea. Cotton smoke puff from my gun matches with enemy stand turned to skeletons! My Anarchists pop up and throw a bomb at the Red Cavalry who fail to notice. I felt sorry for my wounded and let them sit on a hill to the rear to watch the rest of the battle. The enemy dead were piled high on a back table. The game nears the end of time. The bridge in the middle remained hotly contested. Gary had occupied the far bridge but Les's brave lads were still steadfastly preventing him from debouching onto the shore. On the near bridge Lawrence had been driven back and my cavalry and volunteer infantry were spreading out and were attacking his supply train having inflicted twice as many losses as they suffered. The enemy informed us that they were writing the game up as a draw and we were free to publish our own version. of the original scenario. We then assigned forces by the carefully balanced "pick a hand" method. Ron got the US with the convoy. The scenario involves random arrival for the interceptors for both time and location. These are designed around rules using at least an 18 hour game with short moves. We settled on me playing orders as normal but then needing to roll the turn number or less (eg on Turn 2 I needed to roll 1 or 2) for the unit to appear. Another roll determined the place of arrival. Turn 1. The game begins with a bang. I won the toss for initiative and made Ron go first. He led with a Sherman and Tank Destroyer and then started running trucks up the road. We are used to the convoy bring the slowest thing on the table so it was odd having them be the fastest instead. With a clear run it was only going to take 3 or 4 moves for a truck to cross the table which made me uneasy but they are horribly vulnerable to fire. As luck would have it, my 2nd try landed a Stug almost right beside 2 trucks. I trundled forward and was about to open up when he played an interrupt and zoomed off. This was a move I could have stopped with the Counter Intelligence card if I had remembered that I had it. It all worked out though as my command Pzr IV threw the right 1 in 36 combination to pop on table right in front of the truck and riddle it with bullets. Based on the pillar of black smoke it must have been full of fuel drums. Immediately after this Ron brought on another truck and an interrupt allowed me to blow that up as well. Turn 1 and Ron was down 2 trucks. He needed to get 4 into the camp to win, 3 for a draw. We were sort of wondering if the game was almost over. It wasn't. Several turns and many, many cards later.... yes, all the infantry is German except for one heroic Ranger Captain whose platoon has just been wiped out. No more trucks have been destroyed but only one has made it to safety. Incredibly the 3 AFV in the foreground have been trading shots and finding ways to miss. There was still one truck on table and Ron managed to get it to safety by some clever use of cards and options, and blocking my moves. After that, he focused on clearing the road before bringing on more trucks while I focused on getting troops on table and in position, something made harder by him knocking out my command tank. I couldn't do much, but after winning an infantry fight, I was able to end with 3 infantry units covering the roads. It was a bit of a surprise though when another truck zoomed on with a double move and then, when I moved to assault it, zoomed away on another interrupt which I again forgot to block. Winning the initiative on the next turn allowed him to reach safety. 2 down, 2 safe, 2 to go. Ron reached for the deck to deal the next hand but....too late, there were only 3 cards left! Last turn, partial turn. No way now to win, not enough time or cards. German victory. Games end. 2 trucks in, 2 trucks lost, 2 trucks being held off table till help comes and the cards have run out. German victory. In summary, a gripping game! I'm looking forward to another run through as either side. Ron had enough troops to double the forces but this worked like a charm and kept us so focused on the game for 3 hours that we forgot to refill the coffee cups let alone take pictures. There is a lot to be said for standardizing nonessential physical elements of one's wargaming, things like basing. It makes it easier to store spares and easier to share terrain. Part of my armies are committed to 60mm square bases for compatibility. Last November, I started re basing my Atlantica forces onto 60mm bases with the intention of being able to use 1 stand as a unit as I did when using Volley & Bayonet and the original Morschauser Meets MacDuff. With nice thick bases, which I was originally loathe to adopt but now like, you can easily add unit id and even stats to the back. I was very happy with the results but by the end of the year they were on different bases again. 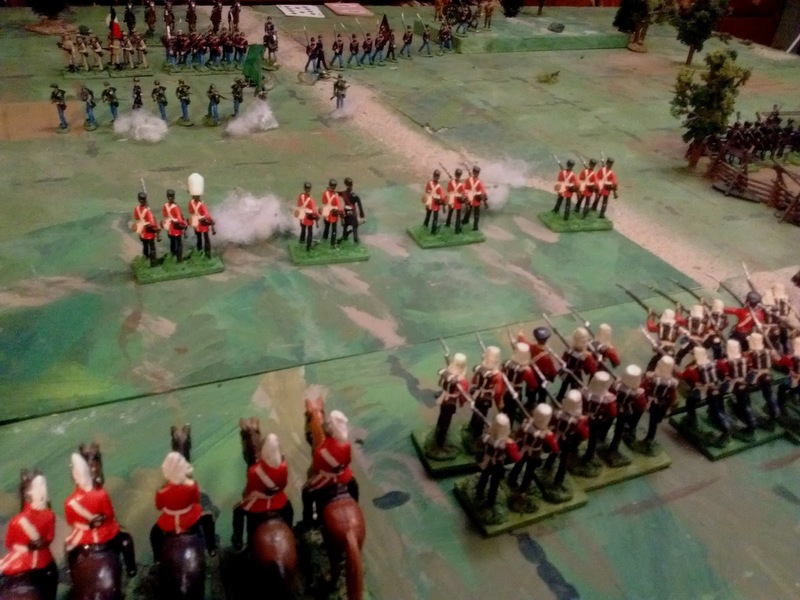 It seems that I did not blog this change or explain it but the issue was purely to do with the grid size, figure size, my table size and the look of linear musket era battles. I was also very unsure about the change so kept the 60mm bases and did not flock the new ones. The issue had not been the bases per se, it had been how they interacted with the grid. 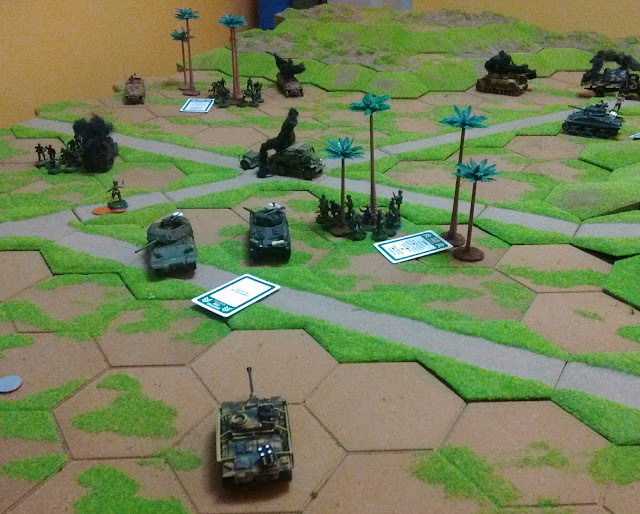 One stand did not fill a 4" grid so that a battle line looked like scattered groups. A smaller grid would not hold 40mm sized terrain or things like an artillery piece. A 5" grid worked ok with 2 stand units, or 2 units per grid, but I could not fit enough squares on my table to give any depth to the scenarios without resorting to half-squares. So I removed the bases, tucking them away pending a final decision, and did a deployment onto temporary 2" bases cut from Orange crates. After a few outings and even more times when I declined to use the rebased armies, along with more games using 1 stand=1 unit, I've decided to take these armies off the grid and off the cramped, too small bases (as in fragile bayonets sticking out too far small) and pick up where I left in November but without the grid. I was going to squeeze 8 figures onto each base like I did last fall but since many of the units are now organized into multiples of 6 and not all poses fit easily into a 15mm frontage, I'm going to stick with 6 figure infantry bases. Each base will be treated as a "wargame unit" but will often represent a "wing" of a battalion in theory. In practice a mounted officer and 2 to 6 stands will form a brigade for game purposes. This brings me back to where I wanted to be apart from the grid but I've found that a painted movement stick and 1 stand units give me most of the benefits of the grid anyway. All my 40mm armies will now end up on 6cm bases except for the NQSYW Charge! units which will remain as singles. Those NQSYW units cross assigned to the Acadian project have already been provided with materials for magnetic sabots. I'm not even going to think about the advantages of converting 40 1/72nd ACW regiments on 120 bases into 60 regiments on 60 bases. Its that time again, my annual "happy to still be here" post. Its a day late due to my bicentennial post but then one of my PT instructors at college often referred to me as "the late Mr. Macfarlane". Anyway, apart from having to miss Huzzah due to a scheduling conflict, this has been the best 12 month period in ages so the goal is to equal or better it. Hobbywise its largely Steady as She Goes. Hopefully a bit more social gaming again. On the homefront the plan is to continue consolidation efforts with more things table ready without that improvised look that has plagued me while exploring options. Cold Wars 2005. One of Rob's Meisterzinn Homecast British battalions disembarks. 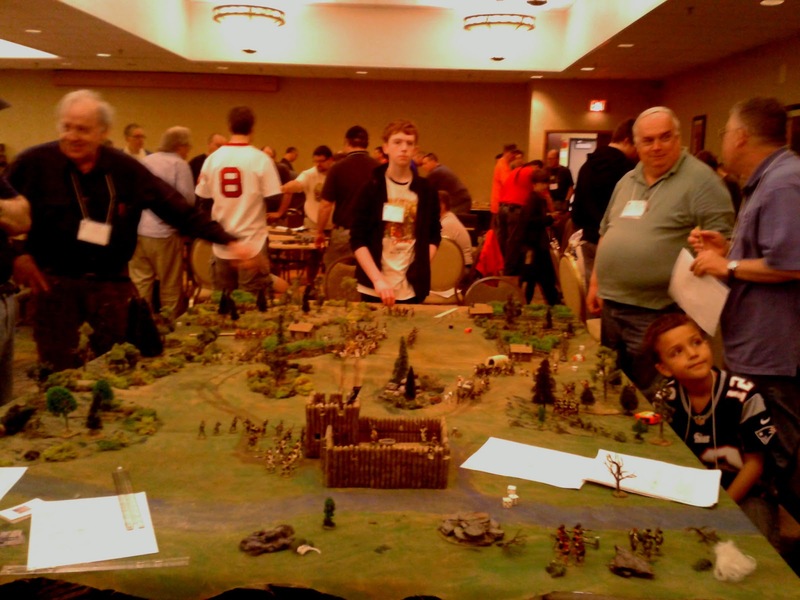 Tentatively Rob & I will be running a French & Indian War game or two at Fall In 2016 in Lancaster in November. Hence the push to get MacDuff finalized and polished. 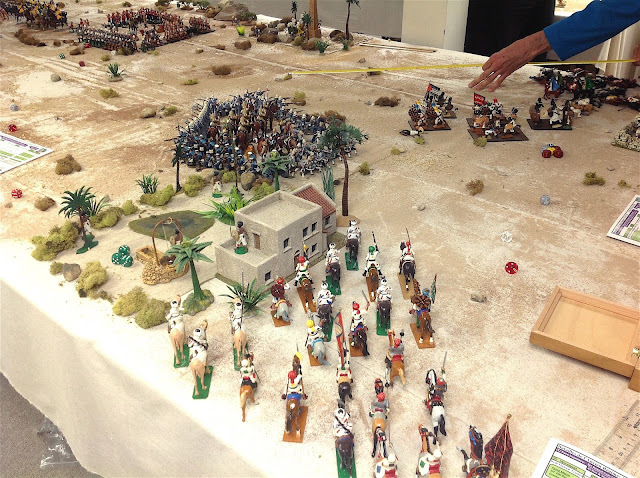 Getting the figures on table momentarily revived dreams of a universal set of rules for games running from French & Indian skirmishes to battles against Baluchs and fighting on both Northwest Frontiers. Playing a couple of games and getting a feel again for the space and numbers of 40mm figures needed to get it looking and feeling right for larger actions was a good reminder of why that isn't going to happen. 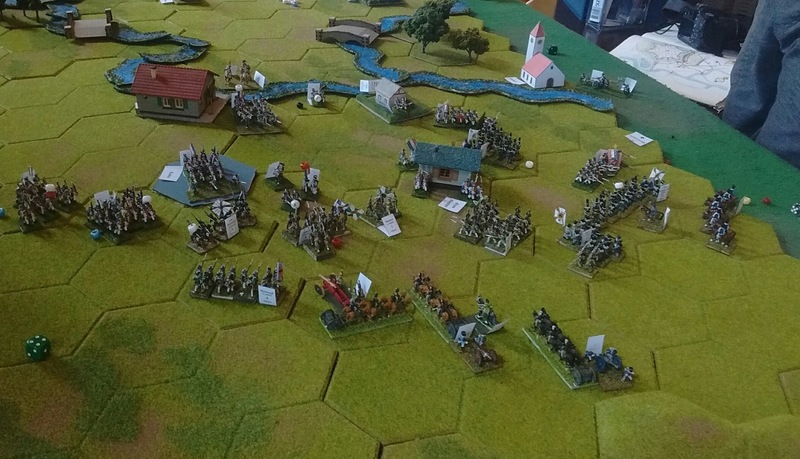 So I will stick with my plan for homecast Acadian games focused on small fictional scenarios but eventually leading up to a Louisburg campaign sometime after the PA British molds come out in a year or two. I also intend to spend significant time with my 4cm Elastolin dark age/medieval figures. If it comes together in time this might appear at Huzzah 2017. However, what I really want to figure out and polish are my shiny Atlantican lads. I've been struggling with the "many small units vs a few large units?" question and predictably it looks like the answer is neither. 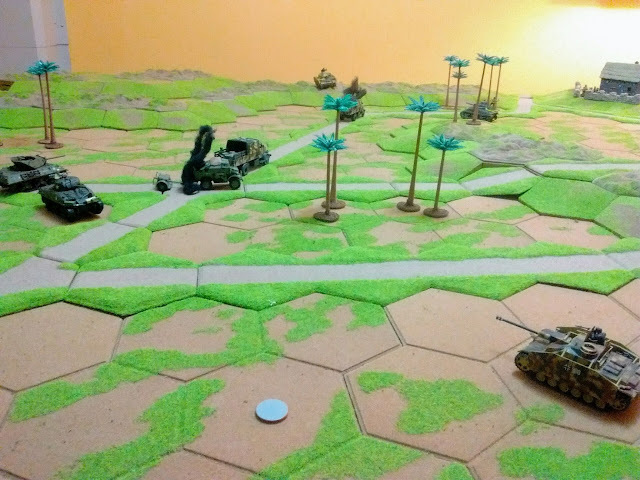 The combination of grid squares, linear warfare and 12 to 18 40mm figures has had mixed results for me but apart from the grid this was always the sweet spot for Hearts of Tin so I intend to make another run at it while keeping unit footprint and ranges as small as I can so as to fit the game comfortably to my 4x5 for most games. I'm not ready to drop the grid yet though so intend to keep it for the 54's and 1900 collections. For some reason the grid combined with skirmishing units seems to make it easier for me to accept small units of big figures with short weapon ranges. That all seems so sensible that I have my doubts but here we go! Forty years ago today was the Bicentennial and there was a large international Naval Review in New York. It was my good fortune be there aboard the USS WV Pratt as an exchange officer serving as Midshipman. I even had the honour of timing the shots for the salute to President Ford. The fleet heading to New York. A non-wargamer might not have thought of a WWI fleet steaming into action. Honest, dead centre, just a little hazy. The Tall Ships and a huge armada of tiny pleasure boats out to see the spectacle. There hasn't been much time for gaming but its past time for my Canada Day post to be replaced so here's a quick post. I decided to try out the muzzleloading rifle era but just trying to arrange the armies was enough to make me lost and confused. Eventually I got it, I'm so used to thinking about battles with battalion sized units for this period that I couldn't quite get my head around what the game represented. Had to break out "The Last Invasion of Canada" and think about a few Indian Mutiny memoirs to get straightened out. Luckily it seems like my existing 12 man battalions will work fine for game "companies" (1/4 of a battalion really at 1:10 ish ). Back to where this all started 20 years ago, but better. 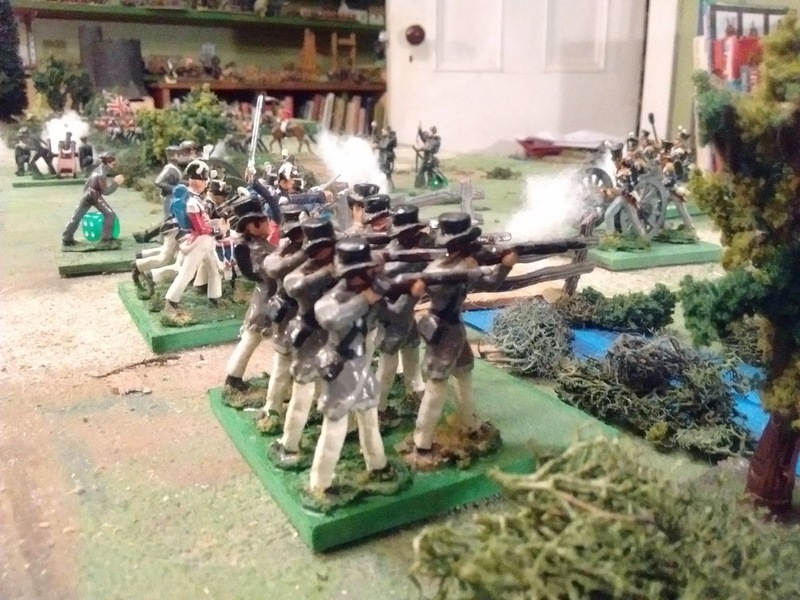 Skirmishers in front, formed companies in support. At some point earlier this century I lost the thread and started thinking about battalions and battles and smaller tables and armies and that's where I took a wrong turn and put MacDuff and HofT on the same track making a small battle like Crysler’s Farm into a small quick affair and making even smaller affairs, like those that made up 90% of War of 1812 actions, too small to be worth gaming. That conundrum led me to park it all till I figured which way I wanted to go with the motley 1812 to 1859 collection. Got it figured out now and while I have enough to play with already, there is room to grow larger armies for 4x7 battles. Probably in one period only and most likely the long delayed fictional hot weather Colonial campaign as a change. OK I won't need that big a home table again but the expansion will bring me up to 1/2 that which will be plenty. I also finally found where the Huzzah 2014 pictures were stashed and finally grabbed a photo editing app for my chromebook. Things are rolling! Oh yeah! The game was good. Same test scenario. It looked like Faraway was going to walk a way with it but in the end it was a hard won victory.